I saw this recipe and had to share – it’s great as you live with a basic kitchen as you only need one pan. Making the doughnuts: Turn the dough out onto a generously floured work surface. Flour the dough and roll it out to about 3/4 inch thick. Cut doughnuts out of dough using a 3-inch doughnut cutter and transfer them to a baking sheet. Gather dough scraps, reroll, and repeat cutting doughnuts until all dough is used. Chill doughnuts for 30 minutes. Fry the doughnuts: Heat about 4 inches of vegetable oil in a large deep skillet fitted with a thermometer over medium-high heat until oil reaches 350 degrees F. – Fry doughnuts three at a time for about 2 minutes per side or until golden. Remove doughnuts with a slotted spoon and drain on a wire rack. Repeat with remaining doughnuts. 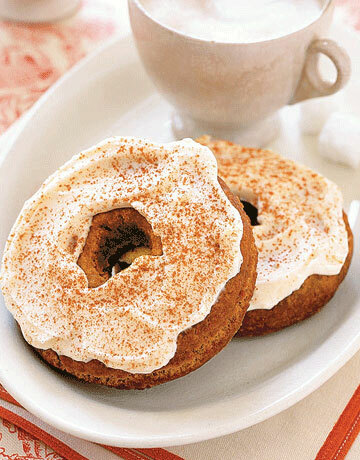 Once cooled, top doughnuts with Creamy Frosting, sprinkle with cinnamon, and serve.